The SEC Basketball Tournament plans on having enhanced security this year. This year’s SEC Basketball Tournament will be utilizing enhanced standards of security in order to keep fans and players safe. Most of these rules are the industry standard for big games and events in the U.S. In preparation for going through the checkpoints for entry, fans are encouraged to arrive early to the arena. Police presence will be heavy in and around the event to provide extra security in the arena as well. When preparing for your trip, make note that there will be strict guidelines for the type of bag that will be allowed into the event. Although the SEC strongly encourages fans to not bring bags into the arena, if you must, these are what you may use. Fans will be permitted to bring in a small clutch bag. The clutch must be no larger than 4.5″ by 6.5″ with or without a handle or strap. If fans need to bring in bigger bags, clear plastic, vinyl and PVC are admitted as well. The bag must not exceed 12″ by 6″ by 12″. Lastly, a one-gallon plastic freezer bag such as a Ziploc will be allowed as well. Backpacks, briefcases, cinch bags, fanny packs (shouldn’t be allowed anywhere), seat cushions, luggage, laptop bags, coolers, camera bags, and any bag larger than the already stated size is strictly prohibited. IMPORTANT: If fans witness anything suspicious at the Women’s Tournament please call (864) 241-3800. For fans at the Men’s Tournament, the number to report anything unusual is (315)770-2050. Rules will be enforced at both the women’s and men’s tournaments. The SEC Women’s Tournament is March 1-5 at the Bon Secours Wellness Arena in Greenville, South Carolina. 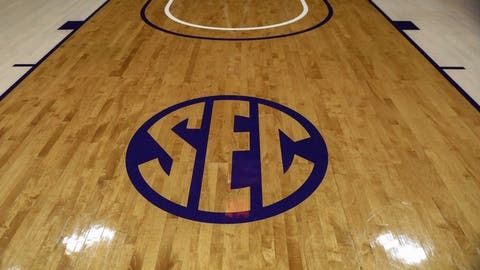 The SEC Men’s Tournaments will then be held on March 8-12 at the Bridgestone Arena in Nashville, Tennessee.